Saturday, February 18, 5 p.m. – 7 p.m.
Mythical archetypes and molecular science find common ground in the work of Inna Timokhina, an artist-scientist with Siberian gypsy roots. Inna’s art expresses and explores the hidden patterns and energies behind our familiar world, emerging from the viewpoints of microscopic and molecular images of life and from the esoteric dreamworlds of the deep psyche. 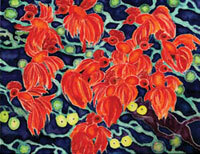 Throughout Inna’s scientific career in biomedical research, she was fascinated with microscopic images and techniques revealing the hidden energies and secrets of living cells, providing crucial elements of her resurgent artistic ideas and visual language. A lifelong affinity for Greek myths and Russian tales also informs her work, expressed as fanciful creatures and characters and deeply resonant archetypal images. 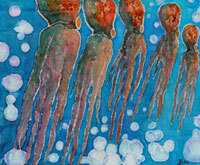 A recurrent theme, bridging microscopic and mythical worlds, is the presence of eyes looking back at the viewer. Are microscopic creatures studying us? Do the residents of the collective unconscious dream about us? 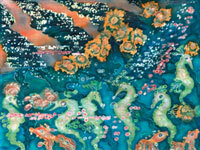 Based on her artistic and scientific backgrounds and an early influence of Japanese ink paintings, Inna’s unique approach, incorporating nature’s energy into phantasmagoric dreamworld images, is expressed in layers of rare botanical inks, wax, aquarelle (watercolor) and acrylics on paper or canvas.